Kramer has released Kramer Control, the company's new cloud-based solution for control and analytics in any commercial pro AV environment. Kramer Control lets users seamlessly navigate to any room in an organization and easily control AV systems, infrastructures, and devices, including Kramer wireless collaboration products, audio products and systems, thermostats, HVAC, lights, shades, alarms, security, videoconferencing, and more. Based on a distributed architecture, Kramer Control offers increased agility and scalability, catering to single-room applications and large global enterprise with the same ease of use. The platform’s combination of software, hardware, and cloud is the result of years of research and development, according to the company, an effort that received funding from the Israel-United States Binational Industrial Research and Development (BIRD) Foundation. The BIRD Foundation recognized the platform’s high level of innovation and contribution to the IoT field. The Kramer Control Platform is made up of three modules: Manager, Builder, and Analytics Dashboard, with options for public, private, or hybrid cloud implementation. The Manager is used for defining project content and scope, for example, building layout, floors, rooms, etc. The cloud-based Builder lets users create, edit, and configure room control systems from anywhere in the world. With access to a library of pre-installed smart device drivers, users can drag-and-drop any device imaginable without any prior programing knowledge. The Analytics Dashboard (powered by Kramer Network) automatically gathers all control data and generating actionable business analytics such as device health and performance, room usage, operational efficiency, energy usage, and more. Data gathering is optional and can be disabled or enabled based on user preference. On site, Smart Units are the heart of the solution. Powered by innovative software technology called a "Brain," Smart Units provide bidirectional control of any device, the Manager, Builder, and Dashboard with universal I/O ports. The solution supports industry standards such as IR, serial RS-232, relays, and GPIO. Upon installation, Smart Units can automatically connect to the Cloud and seamlessly sync for updates in real time. They also update themselves whenever new updates become available. 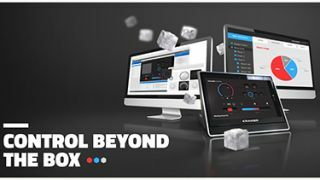 Users can control Smart Units via a user-friendly, customizable interface on a dedicated Kramer Control touchpanel, any third-party tablet, or over the web with BYOD. The solution's non-hierarchical distributed architecture of standalone Smart Units is designed to ensure the system will remain up and running in the case of any single point of failure.